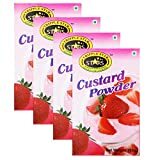 Top 10 Best Custard Powders in India 2019 - Top 10 In India - Only The Best of everything! LATEST product list, updates regularly! Which Indian household does not have at least one fan of custard. There is something about its lovely texture and taste that is quite irresistible. One of the best things about custard is how quickly and easily it can be made and how incredibly delicious it is when served with fruits and cooled in the fridge. Children love custard universally, and as a dessert it is literally unmatched for speed and success. No matter what custard flavour and how you make it, add some nuts, fruits and even peeled orange pieces and sliced banana, and it becomes a wonderful sweet dish. 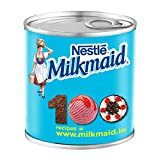 This list of the best custard brands in India, is a daily updated list where only those custard packs that sell the most in India are featured. What used to be the sole domain of brands like Brown and Polson and Weikfield now have a lot more choice and variety. 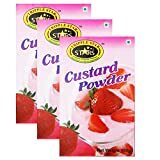 You can go ahead and choose a good option from the best custard powders in India below, and quickly start enjoying some mouth watering dessert. 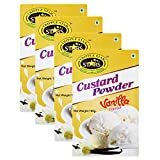 Custard powder is an excellent thickener for milk desserts such as ice creams, puddings, kheer, phirni or fruit salads. Add cream or malai after cooling for a richer taste. You may also use as per your recipe. Makes smoothest and creamiest custards you have ever tasted. 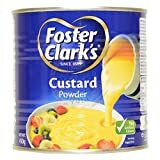 Custard acts as a liquid thickener and is available in different flavours. It can also be used for desert making. Ingredients: cornflour, edible starches, edible common salt etc. It can be blended with condensed milk and sugar to be poured upon ice cream, fruits etc.